A picture book to celebrate. Fogliano is at her best here, with text reminiscent of Charlotte Zolotow’s, Margaret Wise Brown’s, and Ruth Krauss’ writing. Her spare, singsong verse pairs perfectly with Robinson’s naïve style expressed in joyful, retro, multimedia collage. The striking, narrow portrait layout recalls Marc Simont’s Caldecott-winning A Tree Is Nice, but this picture book is much more than nice. It’s splendid. Illustrations feature an ever shifting multiracial cast of children, not to mention cakes, balloons, wrapped gifts, and markers of changing seasons, to accompany and expand upon the text. Whimsical details, such as the inclusion of a giraffe and a sloth as party guests in the illustrations, add levity and surprise. The repeated refrain—“when’s my birthday? / where’s my birthday? / how many days until / my birthday?”—lends cohesion to the book despite the lack of a linear textual narrative. 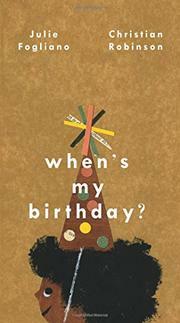 One little girl with straight black hair, olive skin, and large dark eyes (who looks a bit like Robinson’s protagonist from The Smallest Girl in the Smallest Grade, written by Justin Roberts, 2014) appears multiple times, signaling that she is the one anticipating her birthday. The antepenultimate spread shows her losing a fight against sleep as she waits for her birthday to arrive the next morning, and the closing page turns when the big day arrives are “happy happy!” indeed.